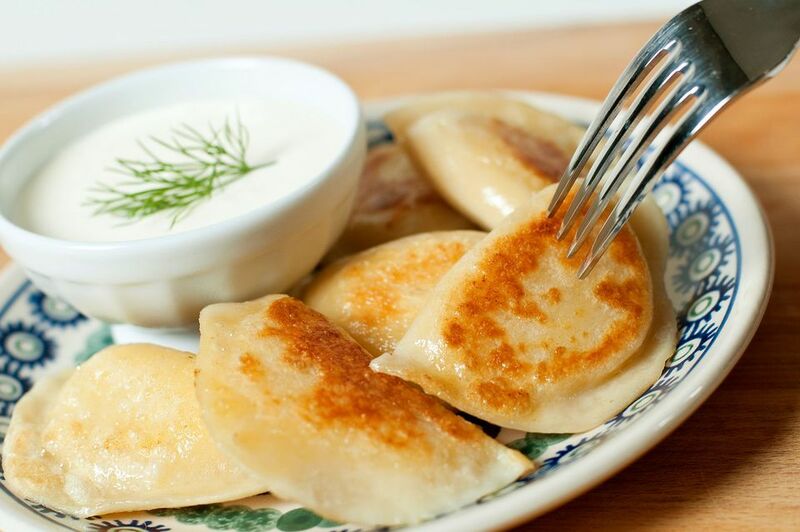 Pierogies, traditional filled dumplings from Poland and other parts of Eastern Europe, are often associated with savory dishes and filled with meats, vegetables, and cheeses, served with sour cream on the side. However, it's also common for pierogies to be stuffed with a sweet filling, particularly during the summer months. This spiced blueberry blend that's similar to a blueberry pie filling, but wrapped in homemade dough and boiled instead of baked in a crust. Instead of serving the crescent-shaped dumplings with sour cream on the side, try it with a scoop of vanilla bean ice cream or vanilla-flavored Greek yogurt for a dipping sauce. In a large saucepan, combine sugar, cinnamon, lemon zest (if using), and blueberries. Toss and place over medium heat. Allow it to come to a boil, reduce heat and simmer 2 minutes. Remove from heat. Let cool completely. When filling pierogi, use a slotted spoon to place 3 to 4 blueberries on each piece of dough for pierogi. Use more berries for Nalesniki. Use the reserved sauce to garnish the cooked, plated dumplings or crepes. Prepare Georgia's pierogi dough recipe. Using a circle-shaped cookie cutter or the bottom of a glass, cut out circles of dough. Place a dollop of filling in the center of the dough and fold it over the filling to make a semi-circle. Pinch the sides with your thumb and finger, making sure the dumpling is well-sealed. Bring a large pot of water to a rapid boil and then reduce the heat to a gentle boil. Drop the dumplings into the water one at a time. Remove the dumplings from the water when they float to the top, an indication that they are done. It typically takes two to three minutes. Drain on a paper towel-lined plate. Freeze the pierogies before cooking by laying them flat on a board until frozen and then transferring to a freezer-safe zip-top bag. To reheat the pierogies, melt a tablespoon of butter in a saucepan and gently pan-fry the dumpling until warmed through. Raspberry pierogies: Replace the blueberries with an equal weight of fresh raspberries. Fill and cook the pierogies as directed. Apple pierogies: Combine a half-pound of chopped apples with 1 tablespoon melted butter in a saucepan. Cook the apples until they're slightly softened and season with 2 tablespoons light brown sugar, 1 teaspoon vanilla extract and 1 teaspoon apple pie spice (or 1/4 teaspoon ground cinnamon, 1/4 teaspoon ground ginger, and 1/4 teaspoon ground allspice). Fill and cook the pierogies as directed.